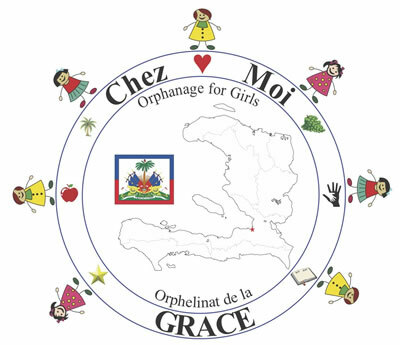 The translation of the Haitian Creole phrase "Chez Moi" is "My Home" and this is what we provide for our twenty abandoned and orphaned girls. 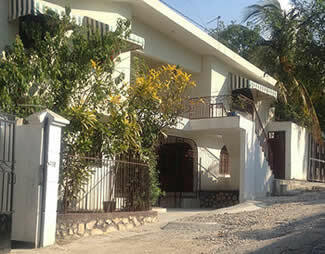 We rented the house shown above after the original orphanage was badly damaged during the 2010 earthquake. The owners are planning to sell the house, so we will be looking for another facility in the near future. Chez Moi Orphelinat de la Grace is an accredited orphanage, registered and inspected by the Haitian Government and the Institute of Social Welfare and Research (IBESR). We respect the work of Mme. Arielle Jeanty Villedrouin, IBESR Director since 2011, as she moves the country of Haiti towards implementing the Hague Convention. Founder, Marie Major. 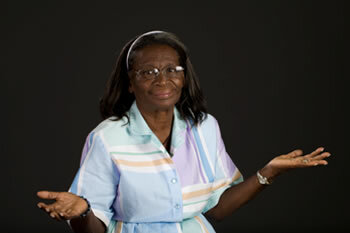 "We are in God’s Hands"
When Marie Major was 20 years old she moved from her native Haiti to the United States. There she attended a Bible college in Florida and went on to become a U.S. citizen. To support herself she worked as an in-home caregiver for an elderly couple. In 1994, when she was 54, the couple died and she inherited the house and cars. Not knowing what to do next, Marie decided to visit her native Haiti and discovered the great need of her people there. At this point, as Marie tells it, she heard the call from Jesus to return to Haiti to build a school and take care of orphans. She answered, "There are two things wrong with your plan, Jesus. First, I don’t want to go back to Haiti and live in a concrete house with a dirt floor and eat beans & rice every day. Second, building an orphanage means taking care of children. And I don’t even like children." But she followed her call and in 1994 Sister Marie sold her inheritance, returned to Haiti, and built a home she named “Marie’s House of Grace,” an orphanage she owned and managed by herself for abandoned and orphaned girls. In 2009, a mission team from Faith Lutheran Church in Lexington, KY spent the night at the orphanage when their original lodgings had no room for them. They fell in love with Marie and the girls and when they returned home, started to find ways to help. Marie’s daughter, Delette Legrand Matheus, took over as Executive Director when Marie retired in 2012. 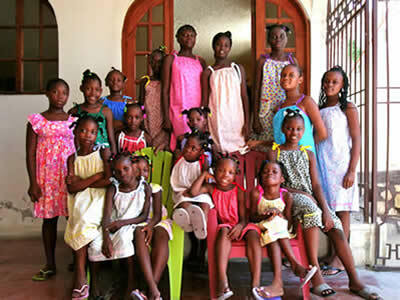 As the orphanage structure was badly damaged in the earthquake of January 12, 2010, Delette Legrand Matheus rented a house and moved the girls to the new location, renaming the orphanage "Chez Moi Orphelinat de la Grace." Our eighteen-plus abandoned and orphaned girls are raised in a safe, loving Christian family-style environment where they may grow and mature into responsible, self-confident young women. The girls speak Creole and French and the elder girls are also learning English. They are either attending Primary or Secondary schools, and will have the opportunity in the future to attend vocational school or college depending on their abilities and preferences. All the girls have passed their official year-end examinations with high grades and we were so pleased that Sarah, age 12, was named ‘Laureate’ of her Secondary school. It is truly a blessing to invest in children’s lives. In the capital city of Port-au-Prince, only 23% of adults have completed secondary school and of those, only 16% passed the state graduation exam. Secondary education is a critical component to alleviating the widespread suffering that poverty causes in Haitian society. We want to give our girls the tools needed to become productive citizens of Haiti and to empower other women to give a helping hand to the less fortunate in their communities. My lovely wife Gina and I now have the special honor and privilege of working as Headmaster and nurse with Chez Moi’s children who are orphaned, abandoned, and even forgotten by the state authorities. First, allow me to introduce myself as the new Headmaster. I was born on May 30, 1983, in northern Haiti, and I accepted the Lord when seven years of age on May 30, 1990. I was baptized on April 24, 1994. Since then, I have continued to live out my Christian faith as a member and maestro of choirs, as a Sunday school instructor for children of all ages. I also have served as secretary and president of the youth association of my assembly for about seven years. In 2002, I finished my “classical” studies and dreamed of becoming a surgeon doctor. But circumstances did not work in my favor. I had to go to the Lycée Jean-Baptiste CINEAS where I spent two years studying sanitary plumbing. After working hard and successfully, I graduated with honors. In November 2008, I returned to Port-au-Prince, the capital of Haiti for further studies, and several months later I entered the Ministry of National Education and Vocational Training, a national teacher education program. After passing the entrance examination, I underwent three years of training. At the end of the cycle, my name was chosen among the 100 national winners. This award allowed me to take part in a program to train street children at the Ranch de la Croix-des-Bouquets. I also studied Legal Sciences at the School of Law and Economics of Gonaïves. My thesis is still pending. Now let me introduce you to my wife, Gina Jean. She was born on January 2, 1987, my own birthday, and baptized by the Rev. Maccule at the age of fifteen. Since then, Gina has led a transformed life, announcing the gospel of salvation to others and participating in various activities of her assembly: secretary of the youth department, a member of the choir, and Sunday school instructor, among other service projects. After Gina completed her “classical” studies, she learned the art of cooking at the Delmas Women's Center during the summer holidays of 2009 and 2010. After completing her high school education, Gina, motivated by her nickname, “gade enfimyè m'nan!" she studied for four years at the Nursing Institute of Delmas and became a registered nurse. On Saturday, July 16, 2016 Gina and I were married. In early 2018, Grace Missions contacted us about working as Headmaster and nurse with the children living at Chez Moi. At first we were reluctant, but upon careful reflection and after consulting the Lord, we responded favorably to the request. So on April 10th we moved in. Gina took charge as Medical and Hygiene Manager. And I became the new Headmaster. With the help of God, we both now confidently say, “We’re on the right track!” May his name be forever elevated! Because our life at Chez Moi is a blessing, we ask all of you to also invest yourselves in the lives of our orphaned children. Pray God to bless our marriage, our daughters at Chez Moi, the Board of Directors, and all who, one way or another, work to advance this ministry in Haiti.